Future Tech Consultants of New York, Inc. (FTC) is an A2LA accredited special inspections agency in Mineola, New York that provides Engineering, Special, and Progress Inspections to Owners and Owner Representatives throughout the New York tri-state area. FTC was established in 1994 and is owned, managed and operated by professional engineers with experience of over 50 years. Our approach is to build long-term relationships with our clients. FTC has earned its reputation for professionalism, integrity, and reliability in the construction industry through its exceptional quality service and impeccable performance record. Our Technical team is comprised of licensed professional engineers, field engineers, certified technicians, and project managers. They have the experience and credentials to provide our clients with a wide range of engineering, special inspection and testing services in accordance with project plans, specifications, local and governmental codes and regulations, as well national standards. This effective use of manpower and proper management personnel, as well as new technological tools, enhances our capabilities to meet the needs of our clients. FTC approaches all of our clients’ projects with the same high level of professionalism. Each project is assigned to a knowledgeable project manager and begins with a kick-off meeting. This initial meeting, with the client and all relevant trades is to produce a detailed plan of action specifically tailored to the project and to our client’s requirements. This can avoid many of the common problems by maintaining a current log for any non-conformances that arise from testing or inspections and gives our clients the ability to know exactly which members of the construction team must correct the deficient work. FTC also prides itself on having an exceptional internal staff that works hand in hand with all of our Field Personnel. This joint effort also allows FTC to run projects efficiently from inception to completion. FTC provides continuous education and technical training for its staff. This allows FTC to keep the necessary lines of communication open in order to facilitate the project’s progress, on or ahead of schedule. 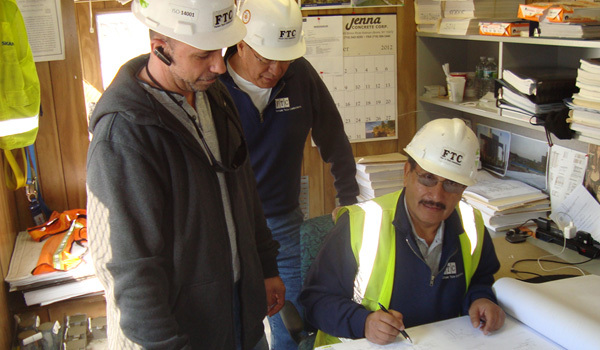 FTC considers itself a key player of the construction team for each project we perform. FTC has a licensed accredited laboratory that performs testing on all construction materials for soils, concrete, masonry, and develop and run concrete design mixes. The laboratory is fully accredited by state, local authorities and is licensed by New York City Department of Buildings (NYCDOB). The FTC lab is operated by engineers and technicians certified by the American Concrete Institute (ACI) and National Institute for Certification in Engineering Technologies (NICET). FTC is proud to be a part of the recent New York City Building code changes. We have been implementing these changes since July 1, 2008. The NYCDOB required these new regulations be enforced by July 1, 2009. The new Codes will enhance building and construction safety through expanded requirements for fire protection, structural integrity, and stronger enforcement on all construction projects. We will embrace future changes and educate our clients of them and guide them through the new codes and requirements.